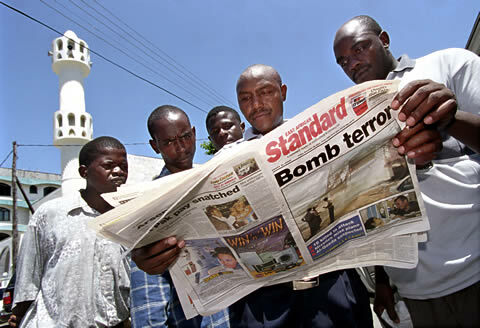 Prior to the 1998 bomb blasts in Kenya in which hundreds were killed and thousands injured, most Kenyans did not know what terrorism was and therefore had no reason to be concerned about it. The 1998 attacks changed all of that and when Osama Bin Laden and his lethal organization attacked the US on September 11, 2001 he forever changed the way of life as most people knew it in the world when it comes to their safety and security. There has not been an attack on US soil since that deadly day in 2001 but even though not to the same magnitude, we have witnessed an increasing number of attacks and threats of attacks in Kenya especially in more recent times leading to the question, why? We cannot obviously compare the might of the United States government with the measly Kenyan dwarf when it comes to available resources in general and more specifically resources to combat terrorism, including intelligence and training but it would be wrong to ascribe this, namely, lack of resources as the reason we continue to suffer these attacks. Within months following the 1998 bombings in Kenya, the US government started pumping money and other resources to Kenya to fight terrorism. However, no one can make a serious case that this money has been spent as intended much like all other monies the country receives in foreign aid. That is problem No.1 and the main reason why we are still living under increasing threat of terrorism at the level we are. Problem No. 2 is simply because we have failed to pass laws that would ensure that our law enforcement is equipped with the appropriate tools to effectively combat terrorism and associated threats. One of the reasons there has not been a terrorist attack on US soil since September 11, 2001 is because the government there moved to pass laws that make it more difficult for terrorists to succeed in their evils designs. Indeed, more than 144 countries around the world have passed similar legislation to combat terrorism since the US passed the tough anti-terrorism law but Kenya is not one of them. A bill to bring this law into the books was proposed in Parliament years ago but shelved for any number of reasons, depending on who you ask but the Prime Minister has asked that Parliament revisit this issue and pass the law. Although passing this law is necessary and long overdue, there are those who still object to its enactment for the wrong reasons. Some Muslim activists, for example, object to the law on grounds it targets Muslims and erodes their civil rights. This was the same objection raised in virtually every country that has considered and passed similar law, which means there has to be a way to reach a compromise that addresses those concerns to the satisfaction of anyone who is serious about combating terrorism. On the other hand, passing laws alone is not going to make us secure in by itself; more must be done and chief among those is educating the public and making sure the Islamist propagandists don’t cast this as a Christian v Muslim issue. All Kenyans, whether Muslims, Christians, Budhists or atheists want to be secure in their homes and within our borders. To the extent the government takes measures aimed at accomplishing this goal, no one should object even in cases where such laws may be deemed to impinge or curtail certain rights or freedoms. It’s a small price to pay than having us all living in a state of permanent fear for our lives. We also must watch out and reject those who rather backwardly want to inject the politics of the Middle East into our finding a solution to more effectively combat terrorism. Having only recently started focusing on this issue of terrorism and the need to have secure borders, we are as a country a long way from even coming close to perfecting strategies and tactics to deal with this menace, which means we must rely on those who know better and nobody knows more or better when it comes to dealing with terrorism than the state of Israel. It would therefore make sense we learn from such states and where possible accept their direct and indirect assistance. Anyone who thinks otherwise is either being naïve or is not serious about combating terrorism. Finally, this is an issue that must not see tribe, ethnicity or party affiliation and not just by words but in deeds. We recently lost our minister for security and his assistant in the tragic helicopter crash in Ngong. The president and PM have the opportunity to consult and appoint their replacements bearing in mind the foregoing and if they do so, we shall have made another step in the right direction in combating this menace, which we must lest we become prisoners in our own country afraid to be out in public.